Dishwasher and microwave safe, the construction plate features food ramps and dividers. Easy grip flatware includes forklift fork, front loader spoon, and bulldozer pusher. Placemat features a construction “worksite” illustration. Two year old nephew loves it!! 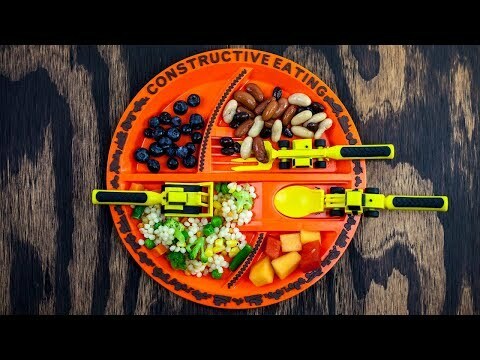 My two year old nephew loved this construction set plate and utensils. Bought for grand kids to get them to like meal time again. They love it!! If your kids are like mine, they’d much rather play than sit down to eat. Wouldn’t it blow their minds to do both at once? Wouldn’t it blow your mind to see them stay seated and engaged at family meals? Maybe even try new foods without a struggle? 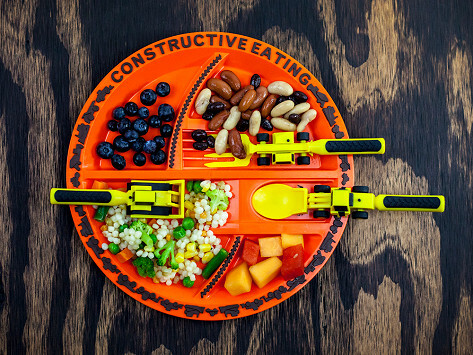 These utensils and plates from Constructive Eating will add fun, incentive, and, quite possibly, tranquility to your table and they’ll have your kids shoveling food in their mouths in no time at all. Literally. In a nice way. The idea for these eating machines came to Jackie Malcolm one night in a sleep-deprived haze, when she wished for a forklift-shaped utensil so her son could entertain himself while eating. The next morning, Jackie and her husband Carter started drafting prototypes and Constructive Eating officially broke ground. So imagine a stress-free family dinner, with little balking or wandering. Picture kids happily experimenting with new foods because it’s so much fun to heft that fantastic forklift. You can just enjoy yourself, and leave the heavy lifting to the pros.